Returning to join me on the podcast again is Dr. Roberto Olivardia. Dr. Olivardia is a clinical instructor of psychology at Harvard Medical School. He maintains a private practice in Massachusetts. Dr. Olivardia specializes in ADHD, OCD, Bipolar Disorder, Body Dysmorphic Disorder, personality disorders and eating disorders. 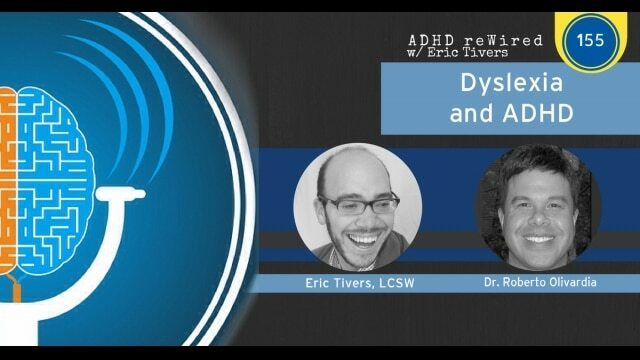 He joins me to talk about Dyslexia on this episode. In this discussion, you will hear Roberto describe what Dyslexia is like for someone that has it. He goes into detail with the professional definition and then explains what this looks like in real life. Roberto also talks about the overlap in symptoms between ADHD and Dyslexia and describes how these are different, even with similar symptoms. We discuss why it’s best that Dyslexia is diagnosed in youth and Roberto talks about some of the assistive technology that is available. [04:05] – Roberto talks about what interests him about dyslexia. [06:47] – Roberto lays the groundwork for this discussion by defining Dyslexia (with an accent). He describes what Dyslexia is like and I share some of my own experiences. [18:27] – Roberto explains what to look for when testing for Dyslexia. Some of these issues can overlap with ADHD, but there is a clear difference. [21:15] – Roberto talks about some of the assistive technology that is available for people with Dyslexia. [22:23] – Roberto tells the story of he and his son testifying at the Massachusetts State House. [26:09] – Roberto talks about some of the teaching patterns for people with Dyslexia. Roberto shares why repeating a grade is a horrible idea for youth with Dyslexia. [29:45] – Roberto believes that children with dyslexia should get diagnosed as early as possible. [31:30] – Being diagnosed with Dyslexia is more difficult for adults and Robert explains why. [35:20] – Roberto talks about a certain font that has been successful for people with Dyslexia. It doesn’t really work for Roberto’s son and this leads to a discussion on how Roberto explains Dyslexia to his son. [39:36] – Roberto shares that people with Dyslexia struggle with foreign languages. However, he has had a number of patients that have excelled in certain languages. [42:02] – A lot of techniques for people with Dyslexia can help people that don’t have Dyslexia. Roberto shares some of these techniques. [50:38] – Roberto explains why it is so important for college students to register with the disability office.